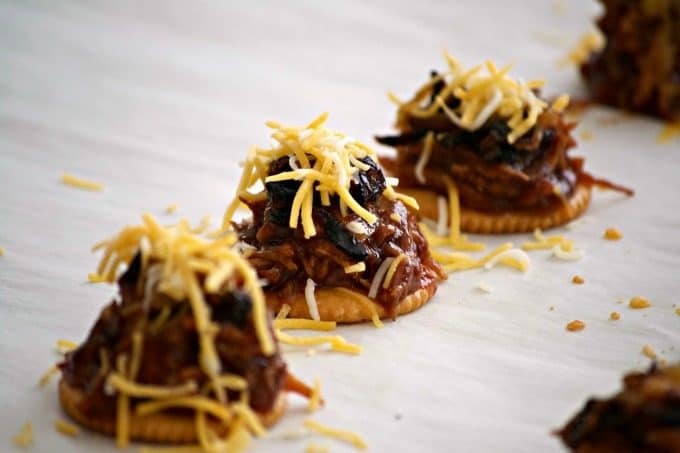 Sweet and Spicy Coca-Cola Shredded Pork Bites – RITZ crackers topped with some shredded pork cooked in a spicy Coca-Cola barbecue sauce, caramelized onions, melted cheese and a dash of cilantro. 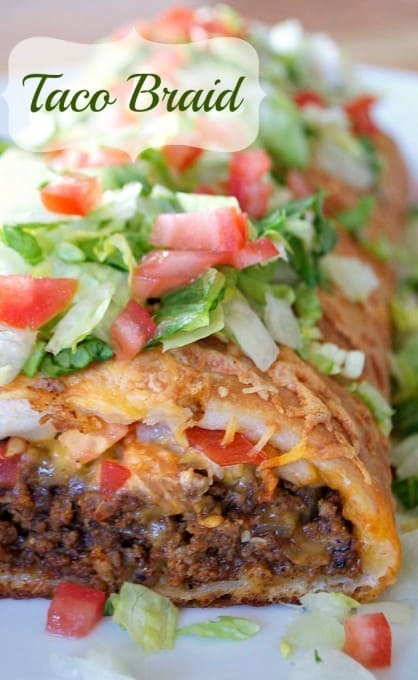 Prepare to have your Game Day taste buds awakened! Have you been watching the games? Football on the weekends is where it’s at and you can’t pull me away from the TV on Sundays now that the season has started. I’m SO into it and it’s not just rooting for my team, I’m just really enjoying watching all the games in general. 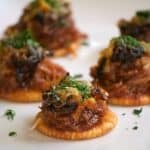 I was shopping in my local Fry’s the other day when I wanted to create a new appetizer for the family just for these events. They’ve just renovated the store and I’m absolutely in love with it! They opened up space by condensing the aisles making them more efficient to find products, relocated the sushi bar, added a gorgeous cheese section with huge wheels of Parmigiano Reggiano, and even put in a wine bar! Kind of cool because there are two TVs on which you can watch the game should you be so inclined to do so. You can be sure you’ll find all you need to make your Game Day great at your local Kroger. 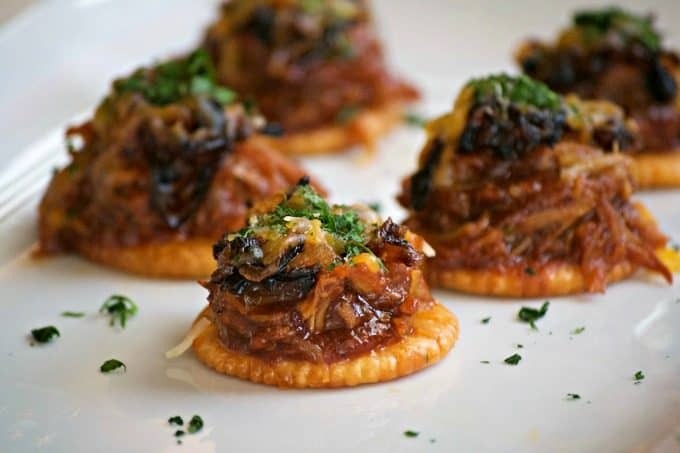 We absolutely love shredded pork and instead of going with the same ol’ shredded pork sandwiches, I decided to spice things up a bit (literally) and put them on our favorite RITZ cracker to make some bite size morsels. While watching men fight over a little brown ball, I always think it’s easier and a bit more fun if finger food is involved. 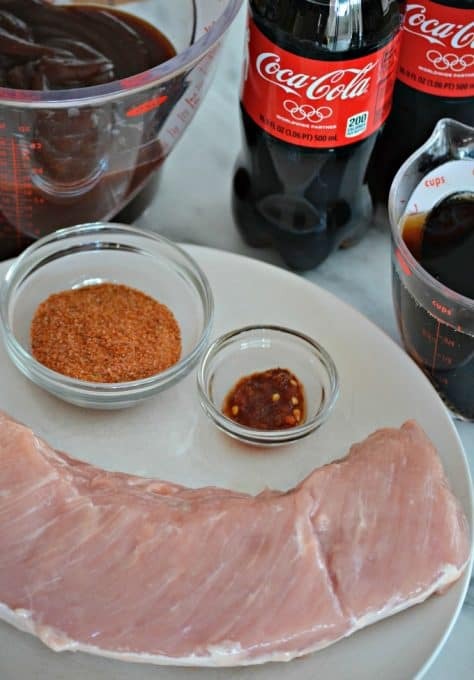 We also like to drink a Coca-Cola or two while watching, but this time I wanted to improve the flavor of the barbecue sauce by adding it to the pork and boy, did it ever! I rubbed the meat with a little chili paste, and covered it in a dry rub. I placed it in the slow cooker with some of our favorite barbecue sauce and the Coca-Cola. When it was ready, I shredded the pork. I put some RITZ crackers on a baking sheet lined with parchment. 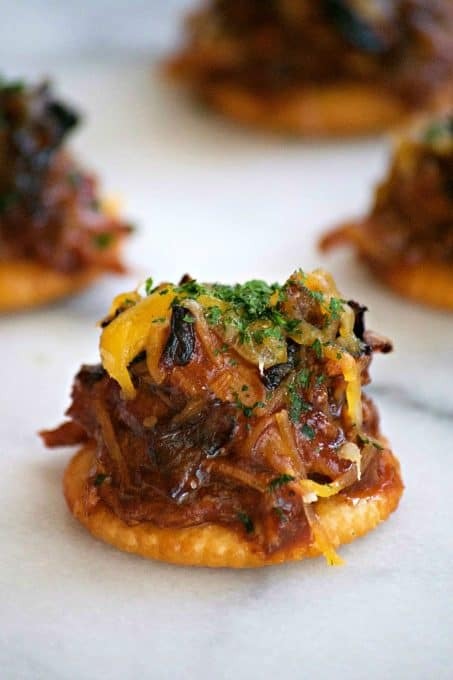 I topped the RITZ cracker with a little bit of shredded pork, some caramelized onions, and a bit of shredded cheese and popped them under the broiler for a minute or two. 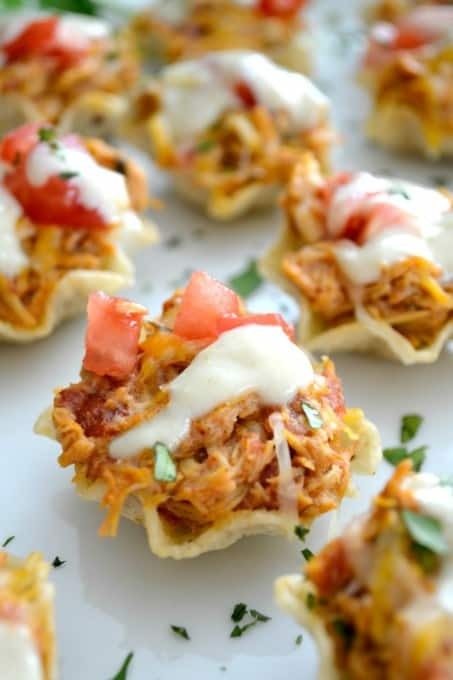 When they came out, they were sprinkled with a little bit of fresh cilantro and VOILA, a great Game Day appetizer was born! Honestly, I have to tell you that the pictures don’t do them justice. There is SO very much flavor in that tiny little bite and everything comes together so nicely. The family absolutely loved them and can’t wait for me to make them again next week. I think I’ve started a Sunday tradition! Be sure to shop for your Game Day Greats so you’re prepared and ready to feed your crowd. 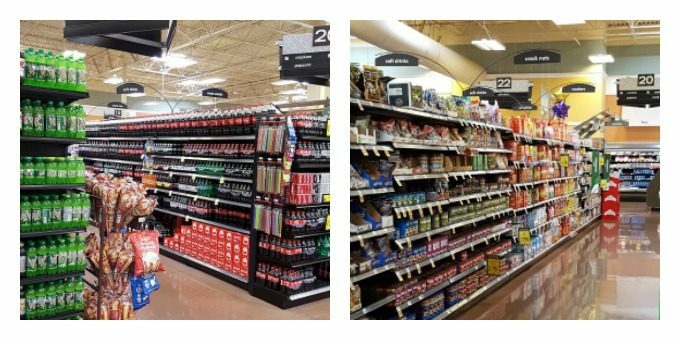 Take a look to see where your local Kroger is and how you can make your Game Day better with Coca-Cola and RITZ! 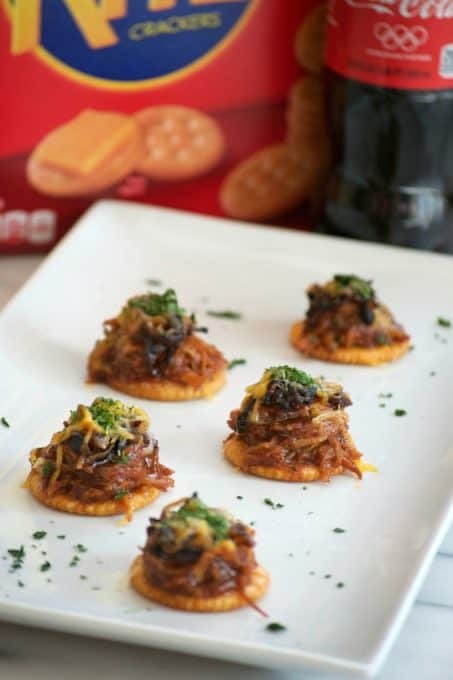 Sweet and Spicy Coca-Cola Shredded Pork Bites - RITZ crackers topped pork, caramelized onions, melted cheese and cilantro. Game Day will never be the same! In a small bowl, combine onion powder, paprika, garlic powder, Old Bay Seasoning, salt, and pepper. Spread the chili paste over the entire pork loin. Rub the dry ingredients over the pork to completely cover. Place meat into the slow cooker and gently pour in the Coca-Cola and barbecue sauce. Cook on low for 4 - 5 hours, turning and stirring occasionally. 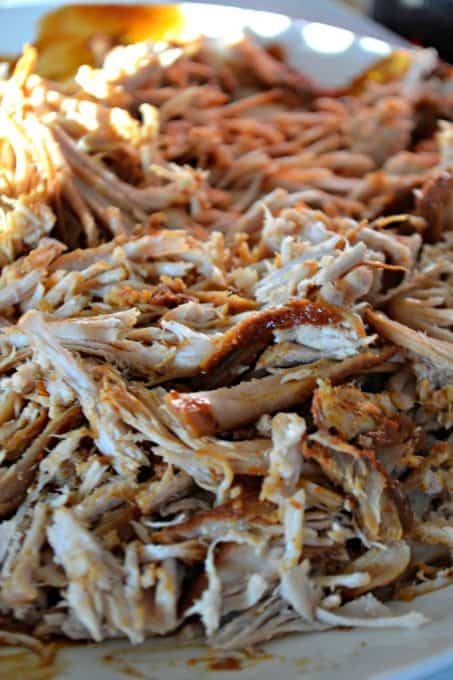 Once pork is fork tender, remove and shred with two forks. 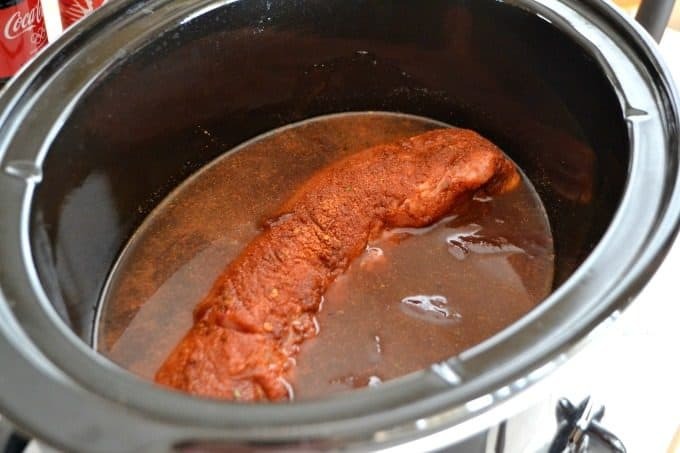 Return to slow cooker for an additional 20 minutes. Preheat oven broiler to low. Prepare a baking sheet by covering it with parchment. 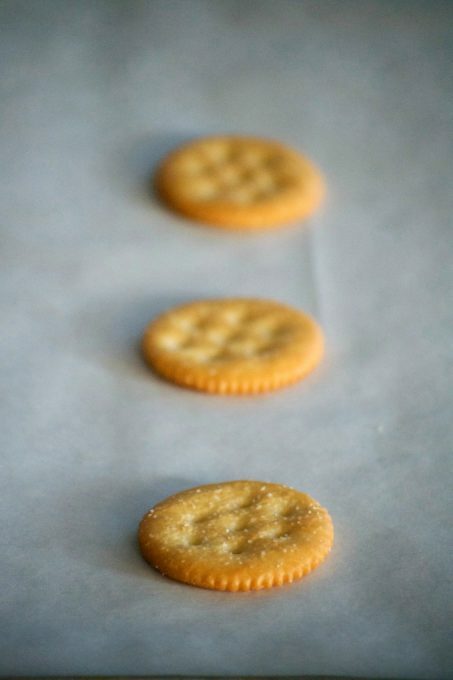 Place the Ritz crackers onto the parchment. Using a small cookie scoop place about a tablespoon of the shredded pork on top. Add a few of the caramelized onions and sprinkle with a half teaspoon of shredded cheese. Place cookie sheet under the broiler for about 1 - 2 minutes or until cheese is melted, watching carefully. Sprinkle each with chopped cilantro and serve with additional Coca-Cola. Oh yumm!!! These look seriously delicious!! Oh boy ! This looks great ! Thank you ! 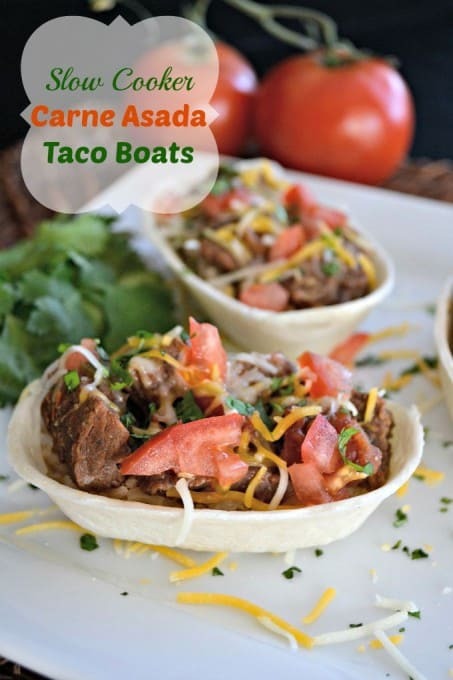 These are perfect for game day or an appie on any Friday night! Thank you Lynne!